Every girl needs a survival kit with her where ever she goes. I have one. I have one in the car, so I can fix anything I need when I need it most. Whether you are late for work, out to dinner, meeting some cute guy, or just going to the gym, you definitely will have times when the one beauty item you need is not there and you'll have to go without. If there is ever a mishap with your makeup, hosiery, hem, or hair, with your kit, you'll have it covered and good to go. I'll be posting a series of items that I have that works for me! No need to go on about your day with dry lips and no color. A handy clear gloss will enhance the natural colors of your lips while chapstick will keep them moisturized. No dry lips kissing others, but a soft and luscious one to have. You could even throw in your favorite lipgloss for some color if needed. 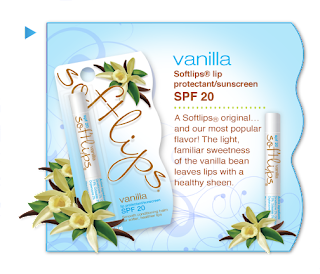 My Favorite chapstick is from the brand Softlip in Vanilla. I love the feeling it gives and the smell. It moisturizes the needs of my lips and keeps them soft throughout the day! They even have a variety of colors to suit every ones' needs. Keep it handy girls! Your lips will thank you! What do you use to keep your lips moisturized?